Melt margarine in medium saucepan over medium heat. Add bell pepper and garlic; cook and stir 1 to 2 minutes or until bell pepper is crisp-tender. Add water; bring to a boil. Add corn; boil 2 minutes. Remove from heat. Add potato flakes, milk and salt; stir until liquid is absorbed. Add onions and cheese; mix well. Heat 1 to 2 minutes or until cheese is melted and mixture is hot. Remove from heat; cover to keep warm. Meanwhile, heat grill. With small metal spoon, scrape underside of mushroom caps to remove dark gills and stems. When ready to grill, spray mushroom caps with nonstick cooking spray; sprinkle with salt and pepper. Place mushroom caps, underside down, on gas grill over medium-high heat or on charcoal grill 4 to 6 inches from medium-high coals. Cook 8 to 10 minutes or until mushroom caps are tender, turning occasionally. Remove from grill; turn underside up. Carefully spoon potato mixture into caps, mounding slightly. If desired, sprinkle with additional cheese. 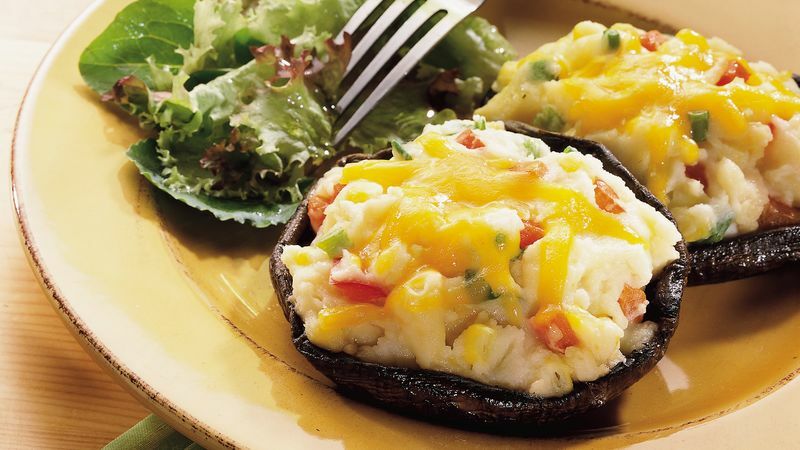 Use Portobello mushroom caps that measure 3 1/2 to 4 inches across for this recipe. This size is large enough for the filling, given that the caps shrink when grilled. You can use another size mushroom caps; simply adjust the amount of filling used in each. Garnish these colorful filled mushrooms with green onion fans. To make fans, cut thin lengthwise slits through the onion greens, extending to bulb end. Place the slit onions in ice water until the sliced ends separate and curl.